LONDON — President Donald Trump's decision to pull out of the Iran nuclear deal has left foreign firms with a choice: Stop doing business in Iran or run the risk of U.S. sanctions. But Richard Grenell, the U.S. ambassador to Germany, warned firms that continuing to do business there would have consequences. "U.S. sanctions will target critical sectors of Iran's economy. German companies doing business in Iran should wind down operations immediately," he tweeted Tuesday night. The Federation of German Industries said any attempt to prevent firms from dealing with Iran is contrary to international law. It called on the European Union to "effectively protect European companies from the effects of illegitimate and one-sided implementation of U.S. sanctions." Under the nuclear deal, formally known as the Joint Comprehensive Plan of Action (JCPOA), the United States committed to ease a series of sanctions on Iran and has done so under a string of "waivers" that effectively suspend them. "It's a huge challenge," said Dr. Sanam Vakil, a professor in the Middle East studies department at the Johns Hopkins School of Advanced International Studies in Bologna, Italy. "The U.S. economy is 10 times that of Iran in terms of size and value, so it makes more sense to do business with the U.S. than the Islamic Republic [of Iran]." 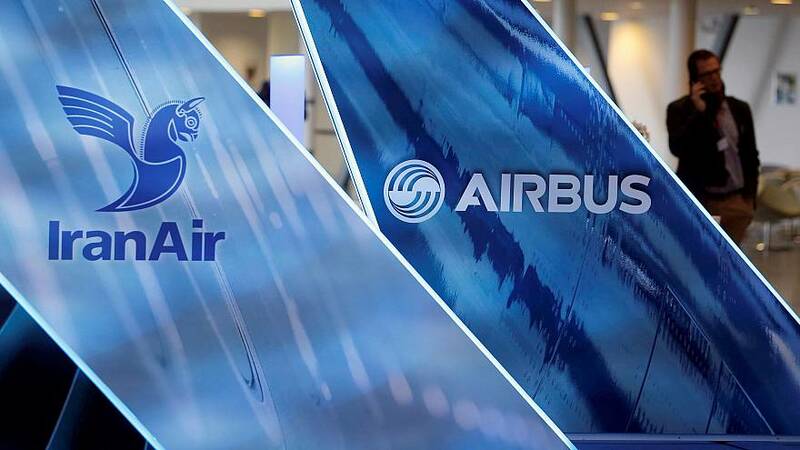 Among U.S. companies, plane maker Boeing has signed the biggest deals, and Treasury Secretary Steven Mnuchin said Tuesday that its existing licenses — as well as those of its European competitor, Airbus Group — would be invalidated. Adam Smith, a Washington, D.C.-based lawyer with Gibson Dunn and former Treasury official, agreed that if sanctions are imposed then companies will essentially be forced to choose between the U.S. and Iranian markets. "It's a cost and benefit question for E.U. companies," he said, explaining that firms would find themselves in the same situation as they were in before sanctions were lifted. "It's a back to the future situation. It would be a world which we have been in before." The Treasury said there will be a "wind-down period" of 90 to 180 days to allow companies to complete transactions with Iran to avoid future U.S. sanctions. On Aug. 6, the U.S. government will re-impose sanctions on activities such as the acquisition of U.S. dollar banknotes by the Iranian government, Iran's trade of gold and precious metals and the country's automotive sector. On Nov. 4, the U.S. will re-impose sanctions on other activities including Iran's oil and shipping industries and its energy sector, as well as on transactions by foreign financial institutions with the Central Bank of Iran. Despite Trump's announcement, France's foreign minister insisted that the nuclear deal was "not dead," adding that French President Emmanuel Macron was scheduled to speak with his Iranian counterpart Hassan Rouhani later Wednesday. In a joint statement on Tuesday, France, Germany and the U.K. did not specifically address the issue of U.S. sanctions on European companies, but said their governments remained committed to ensuring the "continuation of the economic benefits of the agreement for the benefit of the world, economy and the Iranian people." The U.K. government updated its guidelines on exporting to Iran shortly after Trump's announcement Tuesday, saying the re-imposition of the U.S. sanctions against Iran "may have implications for U.K. businesses and individuals dealing with Iran." It advised for companies to seek legal advice where necessary. Vakil said it was now up to Europe to keep the deal alive and protect investment in Iran. "The ball is in the E.U. 's court," she said. "I'm skeptical that companies are going to stay in Iran because the risks are so high."